XL4016 DC to DC step down regulator, adjustable +0.8 to 28vdc output, 8A. 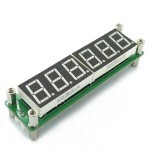 ..
1 to 1000MHz 6 Digit RF Frequency Counter module with Blue LED display. These are id..
1 to 1000MHz 6 Digit RF Frequency Counter module with Green LED display. These are i..
1 to 1000MHz 6 Digit RF Frequency Counter module with Red LED display. These are ide..